Mrs said window would not roll up or down. I can hear electrical “clicking” at front passenger window (or maybe under front passenger seat) but no response at/to front driver window regulator motor. Magically & intermittently the window works. Any thoughts before I start chasing a ghost here? How normal was/is the raise speed when it is working? The motion is smooth and perfect - no regulator plastic wheel clunkiness at all. I’ll check both and report back. Particularly the loom. Ok its not the switch - swapped pass & driver switches. Wiring from door looks fine. I can hear a “relay click” on pass side. Could this just be a bad motor??? Well its not the motor. Its somewhere from the bcu to the motor. Only reason I ask is the description section for the front left window of the elec library refers to C0463 and I want to know how you know that it's actually C0459? ...and back to the issue at hand.... I got 12v through c0459 when activating the switch. So now... where do I look for issues from C0459 to the connection to the motor? I don’t see any obvious issues w the wiring from the connector to the motor. Would it be unbecoming to run new wires to the motor? Fery - you’re the electrical maestro. What would you do here? Can you get it to act up regularly?? If you can what are you getting at the motor? Loosing power? Loosing ground? Both? (Highly unlikely) or still have good power and ground? I would break your issue into smaller pieces. 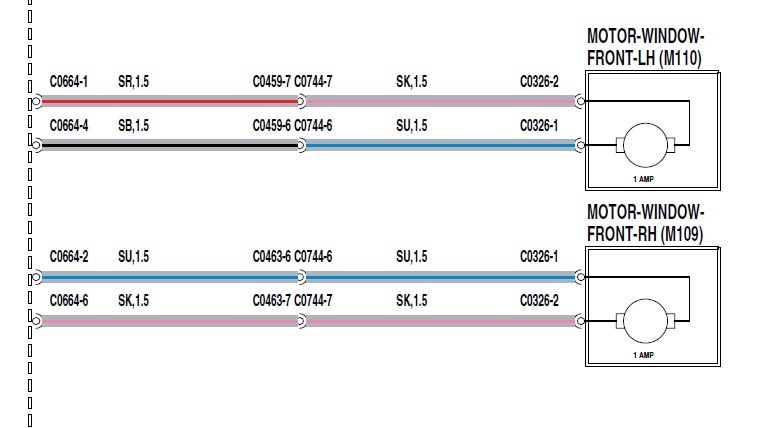 Hi, unfortunately it's quite common to be all kind of confusing informations in those documents and i turned them all over before i pointed to C0459 as i have experience with them, i corrborated the diagram of NAS D2(LHD) with the electrical library and the wire colours also using logic the LH door harness would connect to the connector on the LH side(C0459) cos if you watch for C0463/LHD in the connector views you'll see it's on the RH side)... the electrical library is one for all (LHD+RHD) and in some cases the descriptions are for RHD vehicles as LR's were made in UK...though at least the connector views are shown for both LHD and RHD if it's the case (if you check for C0463 you'll see that for LHD is on the RH side and for RHD is on the LH side so not good for LH door harness... all of the above presuming that you drive a LHD vehicle being on a North American forum.... you have to do those measurements as i said if no visible suspect area. Suprisingly I followed most of all that. 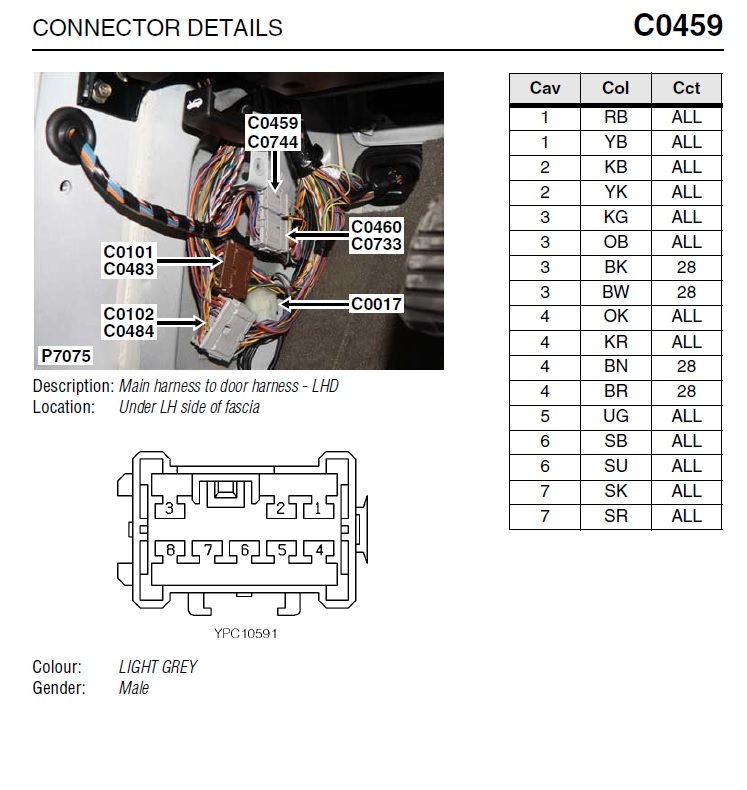 So... Fery, I do get 12v from the c0459 connector BUT do not see any visible issue with the wiring from c0459 to the connector in the door. Would it be lame to “re” run two wires from c0459 to the door connector for the window motor? I’d prefer to do it right, but I guess without seeing any wire damage, just not sure what “right” is here. PS really appreciate the insight - would have been lost w/o it. Have you confirmed whether you have a power OR Ground circuit issue? Previous post you stated “not the motor “ how was that concluded?? Could it be intermittent internal to the motor?????? Keep it simple - you can see wires but you CANNOT see electricity! If you suspect one particular wire you definitely can run a temporary wire to confirm your suspicions but you have mentioned running 2 which leads me to believe you don’t know which one is the issue - power or ground. Again if it’s power deal with that, if it’s ground deal with that. It’s surely NOT BOTH. and still possibly neither.